On today’s Masters Jumpers course at Pals & Paws, Jacksonville, FL I had about a 30% qualifying rate… compared to 60% a couple days ago. And frankly, the real stumper was the opening. I’ll show it to you here. The interesting thing here is that I had the same opening for the Starters standard course… which was well nested to this one. The starters struggled a bit too with this opening. But you know in Starters the rules basis is a bit more forgiving for anything less than a wrong course or a dropped bar. I told a fella who did this opening in Starters while I was standing out in the sun taking a break between classes that the reason he struggled was the pre-cue leadout that he took on his dog. The pre-cue leadout don’t you know is that thing where the handler leads out, faces back into his dog, lifts the opposite arm and starts his dog. Well, I told the fellow out in the sun that it’s a very risky movement; and the benefit should be equal to the risk. The problem here is that the opening gambit is all risk with so little appreciable benefit that it’s a wonder that anyone would stoop to such a thing. Oh, and then came masters. I forget… it’s the masters that the starters strive to emulate. So too many of the masters handlers took a pre-cue front cross leadout and managed to pretty much screw up a good thing here. The thing that I was studying, as usual… is whether the dog takes the precue. I mean, the whole idea of the movement is to tell the dog in advance (“pre”) of the handler’s intention to turn (“cue”). I have a theory or two about why a precue FC will fail so grandly in this opening. Tho it is fruitless for me to argue against an opening that is held in such broad esteem that many handlers have no other depth or dimension in a lead-out. I mean, it is the only thing they know and aren’t going to look at a discussion of whether it’s stupid or not very kindly. Okay… I’m going to bed now. I just wanted to have a moments fun with this before I do. Night. I’ve been very satisfied with the suite of courses I’ve put up so far this weekend at Pals & Paws. More and more I’m chiefly interested in a wide open sequences for movement so that the subtle challenges can be presented with the dog working at full speed. There are a lot of great dogs in this part of the country and frankly some pretty good dog trainers; and maybe a couple three of the best handlers in the country. Of course if you follow my work at all you must know that I’m interested in the training and skill of the handler, as though the handler were a member of the team equal in responsibility and training and skill… to the dog. I find myself very excited by watching the evolution of our sport. I had to share this course with you. I actually ran nearly the same course in Kansas City last weekend. The differences are subtle, but important. You’ll note that the opening works rather like a sling-shot, gathering the dog and sending him at full speed into a technical handling sequence that doesn’t overly degrade the dog’s working speed (#11 through #17), and culminates in a finish with a flourish. This course was quite fun. I’ll share more with you over the next few days. The big text in the right border of this course is for a purpose. After I reduce the course to make exhibitor copies there is certain text that really needs to be legible. It mightn’t be so important in a Jumpers course… but trust me when presenting the nitty-gritty detail of a snooker course or a gamblers, exhibitors like to be able to read the fine print. Okay, this is too weird. I’m on a Delta flight, bound for Atlanta, and I have free access to onboard WiFi. It’s free right now as the service is being introduced. Though I expect in the long run I shall not give over the $10.00 for the brief opportunity to download a bunch of email. But for now it’s a delightful novelty and my first ever blog entry submitted from 20,000 ft (or however high it is that jetliners fly). My main objective in the new League Play game was to get something remarkably different than last week… because I won’t be around to move equipment and the task will be left to Marsha. So for the most part I’ve moved around jumps. And, I’ve even managed to find a set of the floor that accommodates specific skill exercises for upcoming class (which also I will miss). In this lesson plan I want to devote attention to the layered Front Cross and the Post & Tandem combination movement. 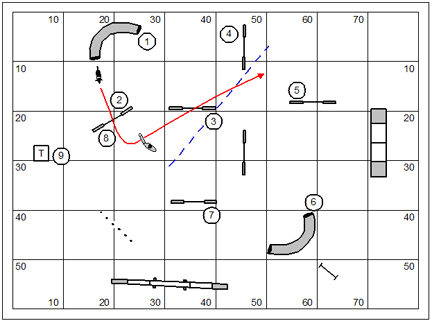 This is a standard course judged under C-WAGS/JFF rules. Performance on the table is handler’s choice. White (& Red) Numbers – In the early going this sequence is all about the transition from jump #6 to jump #7. What we’d like to practice here is a layered Front Cross. Many handlers intuitively develop this skill; but it’s a good idea to practice it. Determination plus intuition make for a pretty good team. 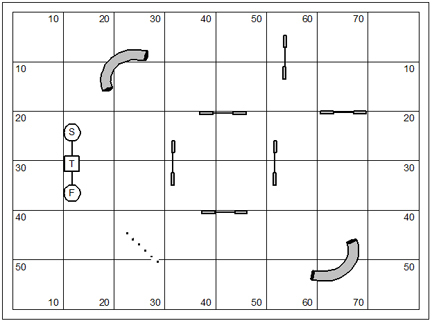 In the layered Front Cross the handler will make the approach to jump #6 with the dog on his left side. 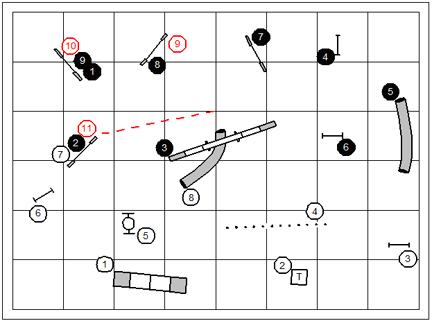 After the dog commits to the jump the handler will slide to the landing side of jump #7 to affect the Cross. Note that the handler’s rotation into the Cross on the landing side will cue the dog to the turn and keep him from drifting past the #7 jump. The movement also puts the handler neatly into a blocking position to prevent the dog from taking the wrong-course dogwalk. The red numbered obstacles, by the way, are a distance challenge for students so that they might be taught to point with their feet. Black Numbers – Again we have an opportunity to practice a layered Front Cross. 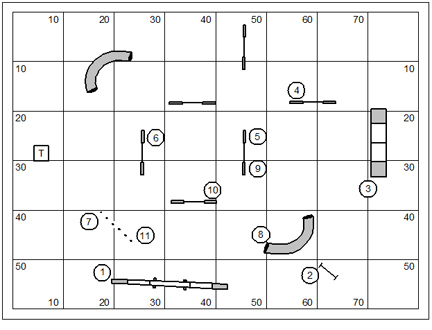 After getting the dog into the pipe tunnel at #5 the handler will drift to the landing side of jump #6 to set up for the long line out to jump #7. 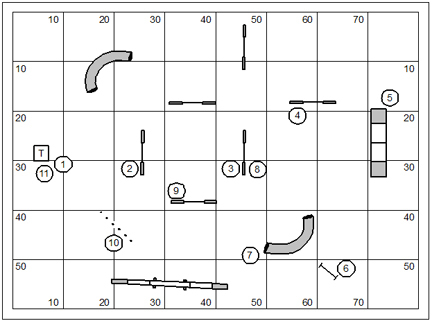 Note that the handler should reserve the counter-rotation of the Cross for the dog’s exit from the pipe tunnel. It would be a shame to use such compelling movement while the dog is in the tunnel and can’t actually see it. White Numbers – The opening of this sequence is curious. A simple dog-on-left Post Turn is as likely to lose the dog to a wrong-course up the dogwalk as anything else. 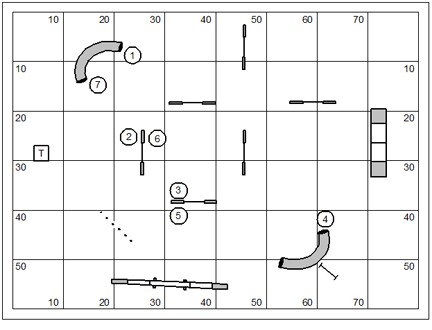 Consider starting with dog on left with a Front Cross after jump #1, using a Post & Tandem solution to open up the approach to the pipe tunnel at #3. Now, in the turn from jump #4 to #5 a Rear Cross might be the best handling option. It might be worthwhile breaking down the set to a study of #3 through #5 just so students can get a feel for their Rear Cross skills. Note that on the approach to jump #8 it might be a good idea to practice a Post & Tandem solution… just to practice the Post & Tandem. Black Numbers – This sequence deserves a Post & Tandem solution from the #2 pipe tunnel to jump #3; and then maybe a more ordinary Tandem from jump #5 to the pipe tunnel at #6. Note that the corner of the turn from #5 to #6 is probably a good 6 or 7 feet beyond the jump. And, just to be playful with it, consider another Post & Tandem solution to the transition from the dogwalk at #7 to jump #8. The analogy that I was playing with was my own feeling particularly when I do seminar work that I will often wrap with a meticulous summary of what I had discussed with that particular audience; or where the lesson plan had gone. Often I try to use the discussion to bring back down to earth what might have been painfully technical in some small ways on its delivery. Oh, and this discussion always begins with… “tell me one thing that you’ve learned!” And of course I’m always amazed at the broad scope of training matters that are retained by those students. Anyhow, if anyone were to set me to music it surely would not be grand opera or anything like that. More likely it would be Ragtime. And so whether I’m judging, leading class with my own students, or teaching seminar… I winge just a little bit if to myself I sound just a little pedantic or erudite; and I can almost hear the syncopated jangle of Ragtime playing in the background of my own consciousness. I’m back finally from Kansas City where I spent the long weekend judging Casa de Canine, a USDAA assignment. And I only get to be home a couple of days before taking off for a long combination trip that will keep me away well into December. I’ve always been fascinated by the players in the Kansas City area (Missouri and Kansas, don’t you know). They are a warm and generous people, though I note, with a little bit of a hard edge with their own dogs. Having opportunity for agility competition requires the championship and a lot of hard work from a few people. In KC Paula Froog has taken it on herself to assume the financial risk and a considerable heap of the labor to make play in the USDAA possible in the area. The trial this past weekend was a small one (relatively) probably due to the calendar shift of the Cynosport championship in Scottsdale. USDAA players who might have supported this venue from moderate travel distances were probably weary from the demands of travel and play at the national championship. Don’t get me wrong. This trial had great ring help. The local players weren’t shy about chipping in to help the trial move along smoothly. Because of Paula Froog the USDAA is making a healthy comeback in the region. This is good. But it’s worth noting that a very few people do a huge amount of work. There are some remarkable dogs in that part of the world. And while there are more Border Collies than ever, there is also ample representation from more common breeds. There are a handful of superb handlers. In general I found my courses overly technical for the region. Over the next few days I’ll likely share several of these with you. So you can be the judge. Next weekend I’ll be judging in northern Florida, also a USDAA gig. I expect that in Florida, given that it’s Stuart & Patti Mah’s back yard, I won’t be much regretting any technical twist in any course. The problem with the very fast dog is that it creates a persistent illusion that the handler should assume a lazy diminutive path while constantly staying behind the dog pushing, pushing, and pushing. I sincerely believe that fast dog handling (behind and pushing) is rather like throwing cards into a hat on a windy day. Precision comes from a position forward of the dog whenever possible. 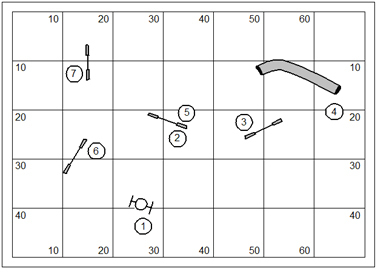 So the riddle of the fast dog that the handler must solve is how to gain that forward position in the technical challenge to show the dog precisely the direction of the course. This is a standard course to be judged under C-WAGs rules. We will allow the position of choice on the table. White – The three-jump serpentine might have several elegant solutions. I’ll be watching closely to see if the handler approaches jump #4 with dog on right or dog on left. 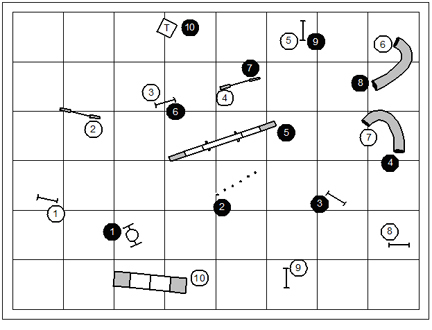 The transition from the #6 pipe tunnel to the #7 pipe tunnel should provide an interesting moment in the sequence. I expect the handler to be more successful with dog on right on the exit of the #6 pipe tunnel. Black – This is not a terribly technical sequence. Early on the handler can demonstrate a solution to the threadle-like transition from the weave poles to jump #3. The handler will probably want dog-on-left for the performance of the dogwalk given the hard turn to the right on the dismount. Note that the table looms after jump #6 as a wrong-course possibility. White – The handler is likely stuck with a Post Turn from the dogwalk at #2. 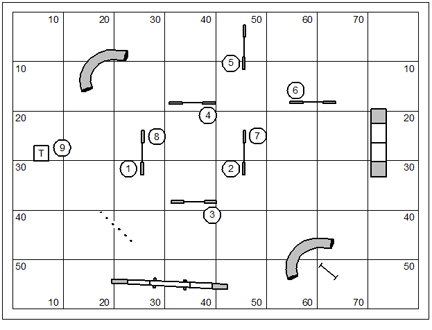 The question will be whether this soft movement will keep the dog out of the wrong-course pipe tunnel option. Otherwise, this sequence is rather straightforward. Black – This sequence might be tougher than it looks. The dog’s path certainly favors the wrong course entry to the #4 pipe tunnel. The challenge for the handler is likely to be how to get into position for a good solution. With the fast dog the handler might want to make the approach to jump #3 for a Rear Cross. With the slow dog the handler might use a Front Cross on the landing side. Again, the transition between tunnels is a bit uncomfortable. The handler should be keen to avoid colliding with his dog on the exit from the #4 pipe tunnel. 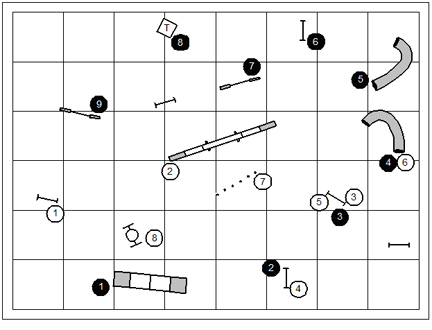 A final twist in this sequence will be the pull-through after jump #7 to the table at #8. Okay, I’m soon out the door for a lovely judging romp in Kansas. I will try to behave myself and not share with anyone how disappointed I have been this year about Mizzou’s performance on the gridiron (especially against Texas). There are really a variety of sequences that might be made of this set of the floor (all based on our league play game… 4-Leaf Clover). We have both the Hobday box and a nice four-jump pinwheel so that we may understand the implications of the arrangement of the obstacles. We have other obstacles on the floor so should be limited to the jumping sequence at center. In this exercise I’d love to see the practice of a layered Tandem in the turn to the A-frame. There’s also a great opportunity to layer to the opposite side of the pipe tunnel while the dog works away over jump #6. Frankly, if the handler doesn’t layer the pipe tunnel it seems unlikely that the handler can avoid driving the dog up onto the wrong-course dogwalk without actually layering to the opposite side of the pipe tunnel. This is a really simple exercise to underscore the importance of the handler’s path. The blue line in this illustration shows exactly how far the handler should advance beyond jump #2 before committing to a Front Cross. Anything earlier will make it terribly difficult for the handler to set a line of approach on to jump #4. In this simple sequence the handler is faced with a 270° turn followed by a four jump pinwheel without an implicit change of sides. The theme for practice in a sequence like this is to find a way to give robust movement to the dog. In our discussion of this sequence in camp we found a way to improve the time of dogs by 2 to 3 seconds (yes… 2 to 3 seconds in a simple 9 obstacle jumping sequence). It’s hard to shake the conservatism out of most handlers—to move them out of the realm of the obvious to the realm of the possible—without actually timing the performance and showing them the stopwatch. For a bit we experimented with using a Tandem Turn to accelerate the dog through the turn from jump #2 through the 270 to jump #3. It did a great job accelerating the dog and actually delivered better times than the default handling plan (stick-in-the-mud dog on left all the way). But, we found that the Tandem really created to robust a path for dogs. Ultimately we settled on the BLT to both accelerate the turn and keep the dog’s path to a neat and manageable size. The BLT (Blind & Tandem combination) is unique among agility movements as it represents a combination movement that requires a speed change (slow to fast dog) between the two elements. Straight away everybody will pretty much see that this sequence will require fast dog handling (behind and pushing). And so the exercise should immediately become how to conduct a Post & Tandem presentation to solve the counter-side tunnel discrimination. In camp I gave a lot of discussion to using the static Post to precue the handler’s intention to make the turn. And after perfecting the fast dog handling option I pointed out to my campers that the necessity to do fast dog handling was a complete illusion, and that they would improve both time and performance by switching to an energetic slow dog handling plan. So we practiced the Flip. I’m always amazed by how such a technical and contrary movement can be mastered in only one or two practice tries. The most obvious and immediate challenge in this sequence is the blind approach to jump #4. 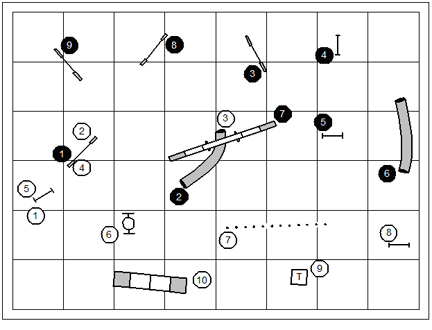 I’m afraid it’s followed by a very technical jumping sequence to get to the weave poles at #7 which should challenge most handlers to adequately solve the “riddle of sides”. It might be fun in this sequence to challenge handlers to send their dogs to the performance of the weave poles from inside the box. Of course the #11 weave poles will be slightly more challenging as most dogs are more likely to miss the nearly perpendicular approach entry when faced with the entry side of the poles. I’ve been a bit quiet I suppose. We’re entertaining the last agility camp of the year here at Country Dream. And today was the conclusion of the third day, of four. It’s a private camp attended by several women from Western Maryland and their dogs. For me life is about to get very interesting. On the morning after this camp ends I’ll head for Kansas City where I have a three-day USDAA judging assignment. I’ll return home for one day, and then fly to Jacksonville, FL for to judge a USDAA trial there. Now as it happens, I have to go to Okalahoma after Florida… and I don’t so much as have time to return home. So from Jacksonville I’ll fly to Dallas… and drive up into Okalahoma. There I’ll be attending a four-day NADAC judging clinic, followed by a three-day trial for judging under supervision. I’ll be home again about the 4th of December, or so. This game is Four Leaf Clover – Dealer’s Choice variation. All dogs will have 50 seconds to perform. Note that the dog starts and stops on the table. 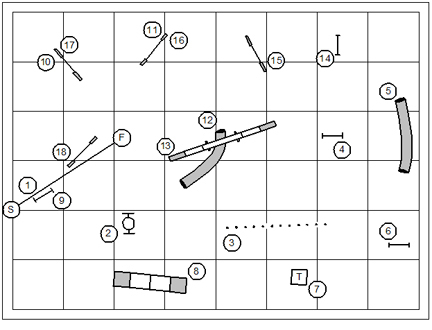 It is the handler’s job to draw the dog into the box at center and then perform each of the “leaves” of the clover – you’ll note that two of them are simply pipe tunnels at the corners of the box; one is a pinwheel; and one is a set of weave poles. “Dealer’s Choice” means that the handler can solve the four different leaves of the clover in the order and direction of his own choosing. There might very well be in this sequence an optimal strategy for order and direction. Four Leaf Clover is scored Time Plus Faults Less Bonus. Bonuses are earned when the handler sends the dog out of the box to perform the obstacles outside of the box. 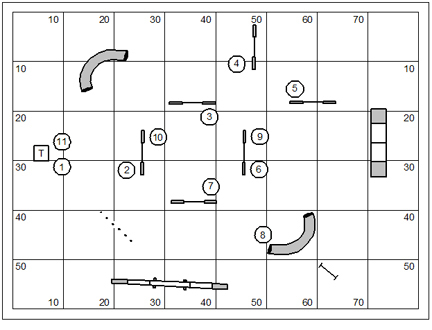 The pipe tunnels are worth 5 points; the pinwheel and the weave poles are worth 10 points; and the table both as a recall at the start and a send at the finish is worth 5 points. Okay I got this note in email. I’ll keep the sender private, but it’s a fun note, nonetheless. I figure since I’m going to sit down and give a thoughtful answer, I’ll call it work for my blog too. Also, the dog may start with less enthusiasm when doing any kind of stay at the start-line while the handler leads out; and it may take the dog awhile before getting up to working speed. This is probably true maybe 1 out of 10 or more dogs in agility. If I recognize this in a dog and handler team, I’ll advise that handler never to do a lead-out unless faced with a dire technical challenge downfield. Only about one in three courses demands a lead-out at all… and yet 90% of handlers will take a lead-out on 100% of courses whether the course demands a lead-out or not. It’s rather like the gent who wears belt and suspenders… just a little insecurity about losing his drawers. And I believe that—as executed—the lead-out is a poor tool for a lot of agility enthusiasts. Often it is just plain lazy; And just as often the handler doesn’t understand how to do his job when releasing the dog from the stay. Does that sound like I don’t like a sit stay? Sorry. Absolutely, start-line stays are an important part of the start-line foundation. I would be nuts to suggest otherwise. But it’s not the only item on the list. I really couldn’t resist drawing a picture for the discussion. There’s no way I can approach the entire Start-Line Foundation in one discussion. This is one illustration for a discussion of measuring the adequacy of a lead-out (one item in the list). Note in the illustration a long line of three hurdles introduced into a four-jump pinwheel out of which the dog dismounts in a wrapping turn into the weave poles. Is that a fair description? The red figures of the handler represent a flawed lead-out. The handler leads out so far that he can’t possibly move well. And further, the handler has fundamentally missed the fact that going into the pinwheel he doesn’t want to be ahead of the dog, he wants to be behind. I know this sounds a little backwards… but just think about it. The farther ahead the dog gets into the pinwheel the farther ahead is the handler when it closes. And the handler wants to be ahead in order to be in position for the tricky turn out of the pinwheel and into the weave poles. Note that the blue figures represent a rational lead-out in this sequence. The first one (the one nearer to jump #1) is probably where I would lead out for my girl hazard… who jumps 8”. The blue figure is where I might begin with… oh, the fastest dog on the planet. Remember, I want him to get ahead. The green figures, by the way, represent my lead-out range if I were to enter the pinwheel from the tandem position. Note that it’s slightly forward of the blue figures because… to do the Tandem entering the pinwheel the must arrive at jump #4 at precisely the same instant as the dog… which requires more of a lead-out. Frankly I probably would not attack the pinwheel from the Tandem position because the Tandem is an accelerating movement. 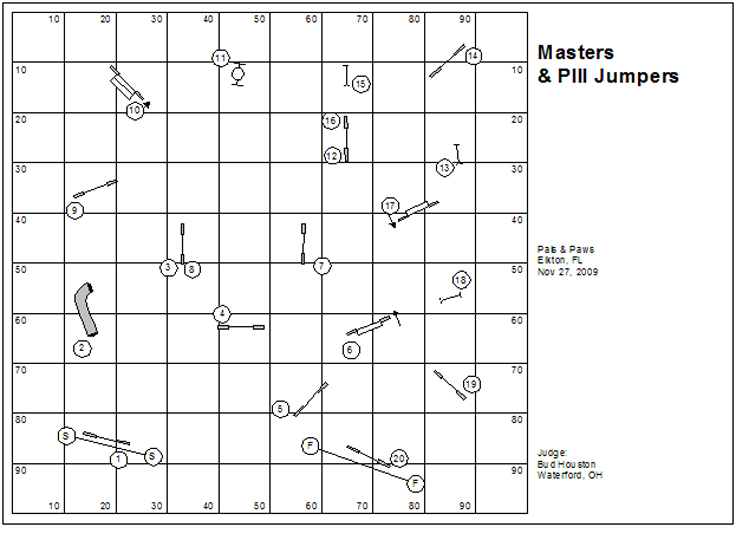 The problem with accelerating the dog is that this pinwheel features two wrong-course options and… there’s still the niggling problem of the handler being forward of the dog for the turn after jump #7. The agility league is designed to organize match play and let people compete as part of a team. Prices are kept very low to encourage participation by large and diverse groups of students. For example, we charge $5 a dog for league play out of this we pay recording fees and registration for the league (to C-WAGS and USDAA, for example). Back in the day when we ran Dogwood, our leagues were made up of 95-120 dogs in any two-month session; running 25-30 teams of three dogs each. Now, in this rural part of Ohio where we’ve moved in semi-retirement, we’ll be lucky to have 15 dogs a week running in league. We will not be running a team league here… all MVP (most valuable puppy). I’ve worked with C-WAGS for more than a year to establish a community-based recreational approach to the game. The CCAP is pretty much the result of that effort. Check http://c-wags.org/ for more information. And you can find information about the USDAA’s league play at http://www.usdaa.com/. We use the Clean Run book of Agility Games as our league play-book; and refer often to the JFF Agility Notebook (over five years of league play games and lesson plans nested for four levels of instruction). You can choose a completely different game. Our games are designed to minimize equipment movement between the game and your class instruction. And, of course, I’ll be publishing a new game or course just about every week in conjunction with our local agility league. I’m hoping too that other clubs who have designed their own games or courses (sometimes for unique competition spaces) will also publish their courses and games to the JFF list on Yahoo so that others might be able to use their courses and play their games. We’ll do this through the week on a ledger system. Create columns for “points,” “faults,” time,” as well as team placements. As dogs run the Game of the Week, record the data in the appropriate column. Each week’s game will involve the collection of different data. For example, Snooker is scored “points, then time.” Timed Gamblers is scored “time, plus faults,” etc. With all the scores assembled determine placements using these accumulated totals. For MVP standings, the first place team earns 10 points; the second place team earns 9 points; the third place team earns 8 points… and so forth, all the way down to ten place, which earns 1 point. All other teams earn a zero for the week. As the league session progresses, team scores are totaled, earning overall placements at the end of the scoring period. We’re working to coordinate competition with a other leagues and training centers around the country (or the world); in which we can pit our performance against the performance of dogs from another league. What we’ll attempt to do on the JFF list on Yahoo is post our ongoing games and standard courses. If another training center runs that game or course, they can send their results to me for posting. So aside from having our own local league results we’ll have results that reflect (kind of tongue in cheek) a national or world-wide placement on the same game our course. I haven’t completely figured out the logistics of this yet. But I’m working on it. This sounds very involved and time-consuming. But the benefits far outweigh your efforts. Back at Dogwood we noticed a marked increase in attendance (people might miss their class, but they’d never let their team down by missing league play), and a wonderful sense of community built around league teams. If dog agility is to remain a game we play with our dogs and our friends, we first want to shift the focus away from the infrequent and costly qualifying attempt to a light-hearted and weekly romp in the park. As well as being just plain fun, it can also serve to strengthen our relationship with our dogs. As we lighten up and get more chances to play the game, our mood lifts, our nerves settle, and our dogs are seen having a much better time. Not at all. Here at Country Dream we will seek affiliation with organizations that support league play, partly to acknowledge their leadership in providing an inexpensive recreational approach to the game; and partly to titling opportunities and recognition of performance from these organizations. If you want to play the game from the cheap seats we are fine with that. Make sure that you pass on the less expensive accommodation to your local agility community. The whole idea of league play is that local clubs can get ready for competition in their own favorite venues. So whether your club is chiefly NADAC, or USDAA, or AKC… or even TDAA you should use your league play to get ready for that venue. Of course most venues outside of TDAA won’t be particularly interested in the wide variety of the games that we’ll play in league (you know how anything but follow-the-numbers makes an AKC player’s head explode). A thing I learned very long ago… all games are training games. It is mistaken to believe that a player who mostly wants to learn to master the numbered course has nothing to learn from games like Tag 10 and Who Dares Wins. Oh… so the answer to your question is: Sure, you can use TDAA equipment. It strikes me that if you change the equipment (and maybe even spacing) on a league course we’ll have to put an asterisk next to your dogs’ results when we post the national or world-wide results for the game or course. Well, it certainly is a bit of work. But it’s good work. It is first of all profitable; but in a way that is casually inexpensive for the player. You don’t have to rent a facility or hire a judge. And if you do it right your students will run their league play game in conjunction with class. So for them there are no additional travel expenses. One of the great values we’ve always found in league play is that you can see how your students are translating your teaching when they are put under the pressure of competition. It is one thing to lah de dah around a training sequence; but it’s quite another when they are being scored and put under the stopwatch. Rather than chasing your students around the region to see how they do in competition in their various venues, you can see them right in your own training center. That will give you valuable input as to where your teaching needs to go with them. Obviously, you won’t be able to put up the same courses and games that people with bigger and squarer floor space can put up. However, the whole intention of this is to use the resources that we have at our disposal. What I would recommend is that you adapt a course or a game to your space, and then post it to the JFF list so that anyone with a comparable space could put up the same game or course. The only real requirement is that you join the community and share your results. While I would like to see clubs register with and support C-WAGS (CCAP) and the USDAA… even this is not a requirement. A Great Dog Trainer’s Resource! This site is complete with YouTube videos for teaching your dog a variety of tricks. I’m a great advocate of trick training because it builds on the training relationship between the dog and handler. For instructors this is certainly an invaluable resource. One of the things an instructor needs to do is teach his or her students how to train a dog. It would be very nice to point them to a good teaching web-site… and maybe even making an assignment for teaching one of the tricks or skills. Every man becomes civilized between the ages of 18 and 25. If he does not go through a civilizing experience at that time of his life, he will not become a civilized man. 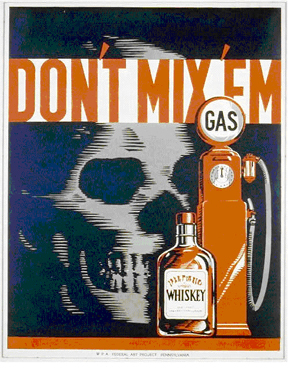 The men who went to war at 18 missed the civilizing. All you young people who served in the war are a lost generation. You have no respect for anything. This is a thing I call the “Figure of Eight”. I set two cones out on the floor and ask simply that the handler draw the dog in a figure of eight pattern around the two cones, giving the dog a constant stream of rewards (treats) out of his lead hand for attention to the lead-hand. Note that the agility Figure-of-Eight is decidedly different from the obedience Figure-of-Eight. 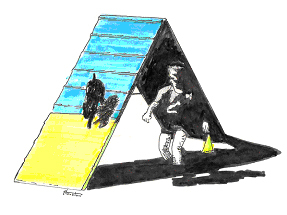 In agility the handler will take the lazy inside path while the dog takes the more robust outer path. That means that the handler must Cross going into the center of the “eight” to get the dog on the opposite side as he goes the opposite direction. This is an important exercise for many handlers, because many have not taught their dogs to give their lead hands close focus in tight technical moments on the course. While I like a dog that will work away on fast and flowing sequences; when things get tight and technical I really like when the dog understands how to come in close to get his direction from a control point. The handler learns several important lessons in this exercise. Aside from the fact that handler and dog must master movement in one of the most complicated character patterns in western civilization (the “eight”); it is implicit that the movement that conducts the dog through the center of the crossing pattern be a Front Cross. Also, you’ll find handlers who will drop their connection with the dog on the outside curves of the “eight”… allowing me, as the instructor, to teach a discipline that is fundamental to the exercise: It is not the dog’s job to attend the lead, it is the handler’s job. Once the handler understands that this is his job he will put in the modest effort required to keep the connection with his dog. The purpose of the Figure of Eights exercise is to teach the dog to work in tight handler focus without regard to agility equipment which might be set near. And so we transfer the skill to the floor where we’ve carved out enough free space to conduct the figure-of-eight movement. Note that the attitude of the handler’s arm is the chief cue to the dog whether to be in handler focus or obstacle focus. When the arm is down and close to the body or leg then the dog should be attentive to the handler. When the arm lifts the dog should be pushed to obstacle focus and away from the handler. I’ll share my more comprehensive discussion of the “attitude of arms” below… and follow that with the escalation of the figure of eights compulsory exercise. It would be good now to test the premise that the attitude of the handler’s arm is significant language to the dog so that the handler can either wrap him tightly or send him on flight over agility obstacles. As it happens the floor is set very nicely for this adventure. Note that out of the Figure of Eight the handler will abruptly raise his or her arm to signal the dog ahead into the three-jump pinwheel. Note that the arm up is a cue to the dog… but certainly not the only cue. It will be the instructor’s job to ensure that the handler understands is job in terms of movement and giving good focus to the work ahead. This foundation training introduces another important foundation exercise, and an escalation of this work, which I will share with you tomorrow. I had the pleasure to get a look at Susan’s very nicely crafted 2×2 Weave Pole training DVD. I shall certainly use her method to train my boy Kory in the Weave Poles… but I’m waiting until he’s a year old before we even think about weave poles. Anyhow, I want to share with you an observation. In the video is a segment showing her IFCS Snooker win with Encore. Anyone watching the performance was probably completely engrossed in the astounding performance Encore gave her in the weave poles… working at full speed, attacking the poles from improbable approaches, and making controlled entries to the poles. Sure, this was impressive stuff. But there was something that I saw that might not be completely evident to the casual viewer. You know that in Snooker it’s sometimes important and necessary to draw a dog past obstacles without actually performing them. That’s something quite difficult with a very advanced and obstacle focused dog. But note what Susan did. As she ran across the field her arm was down flat against her leg (low arm is handler focus… remember) and her dog ran with her completely ignoring the obstacles that they ran past. And then, as soon as her dog slid past the last possible wrong obstacle on the way to the weave poles Susan would lift her hand (high attitude is obstacle focus… remember), and Encore would immediately attack the poles, get in, and go through. To my thinking this was as much an exhibition in understanding the language of the attitude of the arm in communicating with the dog as it was an exhibition in magnificent weave pole performance. This course will be our League game this week. I’ll have more discussion on running an agility league over the next couple of weeks. It strikes me that Western movies have very specific rules for both plot development and characterization that aren’t really recognized at all by Japanese film, or at least Akira Kurosawa. And so Rashomon has for me a dream-like quality… but a gritty, unsettling dream. One of the obstacles most likely to drag on the overall performance in agility competition is the table. While the table should essentially be considered a 5‑second performance, in truth the performance sometimes takes much longer than five seconds and may result in a Non Qualifying score because of time wasted or performance faults. Difficulty with the table performance is typically a training issue. As in many performances trouble at the table is caused by not understanding the element of the table performance to which the dog’s trainer’s attention should be applied. 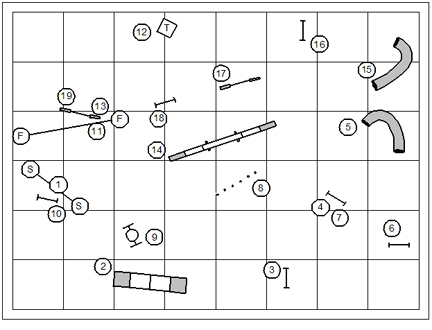 Like many performance training puzzles in dog agility, we can achieve better results if the basic statement of training objective has been posed with sufficient granularity. In the table below lists five distinct elements for training the table performance. Desired performance – The very first task in the training of the table is to make the dog keen not only to get up on the table, but to seek it out. When the handler cues the table the dog should move unwaveringly to the table, without having to be led there by the handler, and promptly get up onto the obstacle. Problem Indicators – The dog will bypass the table as though it does not exist; or, will go sniffing or wandering off, finding almost anything more interesting than the approach to the table. Training Remedy –This is accomplished this in a very basic way… the dog is lavishly rewarded for getting on the table when directed to do so. Repeat this over and over again. Proofing – The handler should allow the dog to seek out the table without being led there. Even in the early steps this should be a progressive sending exercise. The training task is complete when the dog keenly drives to the table without overt manipulation or coaxing by the handler. Notes – Avoid making the table a place where momma gets mental! Never create a negative association with the table (or any agility obstacle). Desired performance – When the dog gets onto the table he gives immediate attention to the handler in anticipation of the next instruction. Problem Indicators – After getting onto the table the dog will sniff or stare off into space for long moments; or may dismount the table to go wandering off as though on a break. Training Remedy –The handler puts dog on the table and simply waits until the dog makes eye contact, whereupon the dog immediately gets praise and reward. Repeat this over and over again. Proofing – The training task is complete when the dog is keen to the game and tends to whirl about to give attention to his handler every time he gets onto the table. Notes – Avoid any kind of obedience performance while charging the attention step. An obedience performance is very poor reward for attention. Desired performance – When the handler cues the performance the dog quickly assumes the correct position. Problem Indicators – The dog does not assume the correct position, will give play bows when the handler asks for a down, or will lie down when the handler asks for a sit; or the handler must hover over the dog, repeating a command or making extreme gestures to get the dog into position. Training Remedy – When teaching a down the trainer places a bit of food in his fist and drops the fist to the table, giving the command to “lie down!” When the dog gets into a down position the trainer immediately opens his fist to allow the dog to take the treat. When teaching a sit the trainer places a bit of food in his fist and rocks it past the dog’s ear, giving the command to “sit!” When the dog sits the trainer immediately opens his fist to allow the dog to take the treat. In these simple training steps is that the dog will quickly learn the game and will endeavor to teach the handler to open his fist promptly! The dog’s trainer must transition from lure to reward as soon as possible. That means the trainer stops holding a bit of food in his hand and will instead rely on praise and reward to make the training point. When the trainer makes the transition to simple reward he should also work to put distance between himself and the dog and vary his position when giving the dog the command to assume an obedience position. Proofing – The training task is complete when the dog readily and quickly assumes the correct obedience position when cued to do so by the handler without regards to the handler’s proximity. Notes – Avoid harsh and aversive obedience training methods. Avoid two-part performances; in other words, if the performance is a “down” the handler should not ask the dog to sit first, and then lie down. If the dog competes in a venue that requires only a down the training steps should contemplate a seamless performance in which the dog gets up onto the table and lies down. Desired performance – The dog will remain in the required obedience position for however long the handler demands without the handler repeating the command and whether or not the handler changes his own position (or otherwise twitches) during the performance. Training Remedy –A “stay” command is incorporated into the performance after the dog has actually learned to assume the required position. Note that this training can be given to the dog away from the table. Consider this method… make the training a meal-time task. The trainer puts the dog on one side, and his food dish on the other. After putting him in his obedience position the trainer will give the command to “stay!” While the dog stays the trainer till reach across his body, taking one kibble at a time to give to the dog. If the dog breaks the position, the trainer will put the kibble back in the bowl, and place the dog back into position. The dog quickly learns that he must work for his meal. As the training progresses the bowl will be placed at greater and greater distances so that the dog must wait while the trainer moves back and forth between himself and the food bowl. Again, if the dog breaks position the handler will very casually put the food back into the bowl and return to the dog to put him back in position. It shouldn’t take too long before the trainer is shuttling the dog’s food a kibble at a time from one side of the room to the other while the dog patiently waits (works) for his food. Proofing – The training task is complete when the dog the dog consistently maintains the required obedience position while the handler moves in any direction and to any distance. Notes – In general the trainer should avoid repeating an obedience command. It’s okay to give the command to “stay” in an authoritative voice; however, the command should not be harsh or strident. The correction for a dog breaking his stay should be neutral, and matter-of-fact. The true correction for the dog is the small detail that he earned neither praise nor reward. Desired performance – The dog immediately dismounts the table—with energy and enthusiasm—when given a release cue by his handler. Problem Indicators – After being given a release cue the dog continues to languish upon the table or leaves the table listlessly, with low-energy. Training Remedy –If dog is keen for a game with a toy, the toy might be a better reward in this training step than food. During the table count the trainer wants to build up a tension and expectation in the dog… a bit of electricity for the release. Play a game of “Ready! Set! Go!” … releasing the dog on the “Go!” word. Immediately whoop & holler and give the dog a game with the toy. If the dog breaks position in his anticipation with for the game, make the correction quite neutral, simply returning to dog to his position on the table to retry the training step. Proofing – The training task is done when the dog consistently dismounts the table full of energy and excitement. Notes – The release from the table should be a verbal cue. You are currently browsing the Bud Houston's Blog blog archives for November, 2009.